Des is worried about going abseiling with his boss. Jim tells Beverly that they can't allow Rhys's real parents to blackmail them. Matt and Lee are messing about throwing water at each other. Nick calls round with the sketches for Matt's bike. Matt has a look and is enthusiastic, but he won't show Lee - she'll have to wait until it's all finished. Nick reckons they can start the modifications straight away. Beverly is moping around (just for a change). Todd and Helen are washing up and chatting about Des's abseiling plans. Todd is chuffed to be back with Melissa and heads off to meet her at the Coffee Shop. Jim comes in and sees Beverly is open. He tells her if they make one more payment to Rhys's parents, they'll be doing it forever. Helen agrees - if she pays them, she's only prolonging the agony. Jim tells Beverly to set up the meeting with this Adam character and he'll sort things out. Nick and Matt are chatting about the bike and about Sharon's sunburn. Jim comes along and asks why his car is out in the street(!) They get talking about Matt's bike and Jim ends up offering Matt a job at the workshop. Matt happily accepts. Beverly is sitting absolutely still in the living room while sad music plays. 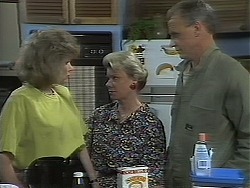 When Helen eventually comes out of her room, Beverly tells her she's just going to pay the money. Helen tells her again that she can't give in to blackmail. Just then the phone rings and it's Adam. Lee has given Todd a milkshake on the house in the hope he'll tell her what the motorcycle design is(!) He won't though! Melissa comes in with her photos from America. Todd takes them off her and has a look. He's surprised a picture of Melissa with her arms around another guy. TODD: You were two-timing me, weren't you?! Jim tells Helen that Beverly has set up a meeting with Deborah and Adam for later that afternoon. Jim tells Helen that he has a plan to stop Adam extorting money for the baby. Helen begs him not to take risks - Adam must be sub-human if he'll sell his own child. Melissa explains to Todd that school is different over there - things are going on all the time and you need someone to go to things with. Todd isn't impressed, even though Melissa points out that he did the same thing with Cody! Todd reckons that it's different because Melissa is a girl(!) She storms out. Nick and Matt have finished the modifications to the bike, and have replaced the tarpaulin. Adam has arrived. He is pretty hostile and asks for the money. Beverly tries to get him to agree that this is the last time she'll give him money, but he reckons he's on to a good thing here. If Bev doesn't pay, Deborah will apply to have Beverly's guardianship revoked. Unfortunately for Adam, Jim and a couple of policemen are hiding in the kitchen and have heard the whole exchange. The police grab Adam. Adam is trying to talk his way out of the situation, saying that Beverly is nuts. The police don't believe him though, and says the courts don't take kindly to blackmail and extortion, especially when a child is involved. Adam shouts that Deborah will put Rhys up for adoption before she lets him stay with Beverly! Beverly is horrified. Matt and Nick are hanging out by the pool. Matt suggests that Nick tries something different, like cartoons or animation: there might be more money in it. Lee comes round and wants to see the scooter, but the guys say it's not time yet. Matt tries to get Lee to come in the pool, but she doesn't want to. In fact, she looks quite scared by the prospect. Todd is moaning to Helen about Melissa's American boyfriend. Helen points out that Todd was doing the same thing with Cody. Todd reckons that it's OK for a boy to be popular, but girls are meant to stay faithful(!) Helen is appalled by this and tells Todd off for being childish. After all, Melissa was very understanding about Cody, so Todd should show the same level of maturity. Matt and Lee are hanging out sitting on deck-chairs. They chat about being only children and how neither of them really felt like they belonged in their families. But things are better now - they've found each other and they're happy. Matt heads back to the pool. Beverly is on the phone to Deborah who tells her that she's going to see to it that they lose Rhys. 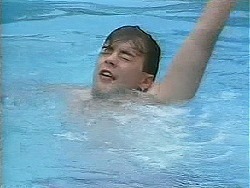 Matt and Nick are messing about in the pool while Lee sits on the side. When Nick has popped into the house, Matt asks Lee to come in the pool, but she doesn't want to. He starts pretending to drown and Lee is not impressed. She shouts at him to stop.